Ryan Fraser has an explanation for his up-turn in form at Bournemouth. "I've changed my outlook this season," he tells Sky Sports. "The seasons before were about learning, and I still am learning, but I used to get too caught up in the performance aspect, goals and assists. "I started overthinking that, and started making mistakes that wouldn't usually happen. So this season I've just tried to enjoy my football; it might sound easy to say that, but I just go out and try to think of going to play football with my mates, playing football like I've loved doing all my life, then these things come along with it." The Scottish winger has seven assists, more than any other player, and four goals in 15 Premier League games this season, with Bournemouth sitting in seventh place ahead of the visit of Liverpool on Saturday, live on Sky Sports Premier League at 12.30pm. Eddie Howe's side keep impressing, and Fraser's energy and pace on the wings is becoming a hallmark of their play. "Obviously as a kid growing up you used to play with your mates, no pressure, and the best came out of you. Things would just come out of you, skills, scoring unbelievable goals. Now there is so much pressure, especially in the Premier League, and sometimes your mind gets blown away by all of the pressures. "This season I've thought, just go out and take the pressure off yourself, go and play with your mates and everything will be alright." With his outlook on the pitch changing, his confidence has gone through the roof. Asked if this was his best-ever start to a season, the 24-year-old said: "It's got to be, start-wise and confidence-wise. It's early doors though, I'm just trying to take as much confidence as I can from it. The team is doing well, which is the important thing. "You know how things can change so quick, but on a personal note I am happy with myself." 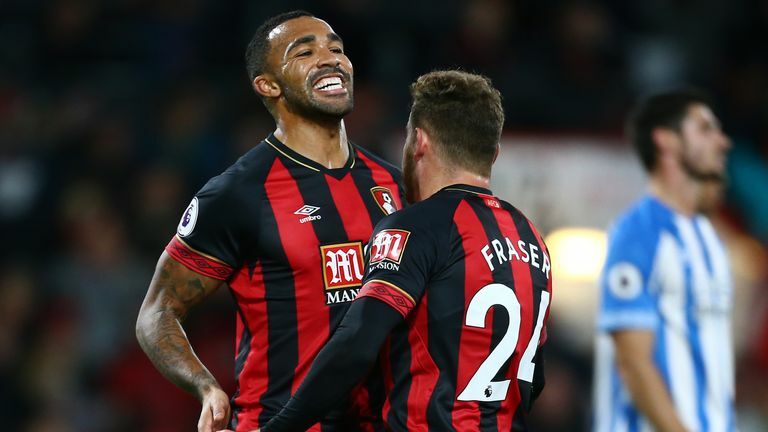 His telepathic understanding with top scorer Callum Wilson prompted both strikes in their 2-1 win over Huddersfield, with one creating a goal for the other, and Fraser gave an insight into their secret. "[We know] where to be when we've got the ball. If I've got the ball in a certain type of area, I'm not going to check back, he knows what I'm going to do. "We live on the same street, so we're close enough! Before games he's always onto me: 'Get me a goal, get me a goal!'" Bournemouth always guarantee entertainment, and the Liverpool clash on Saturday should be no different, given recent results against Jurgen Klopp's side. "You hear people say a lot these days, if there is no competition you become safe in your performance because you know you've got nobody taking your spot. You think: 'Oh well, I'm going to play next week anyway'. "Having competition, you're always on it. You go into training and even there you want to be better than your team-mates, you always want to be the best."